In the ever-changing world of marketing, it can be impossible to come up with new ways to showcase your business. Luckily, there’s a tried and true factor of business that will never let you down: your customers. If you’re struggling to market your business, the best thing you can do is seek to improve the relationships you already have. When you want to turn your focus on your current clients, try these beneficial methods to connect with your customers and forge lasting relationships. Every consumer wants to feel appreciated by the businesses they love. The easiest way to do that is by holding customer appreciation events with complimentary snacks, prizes, and games. Try advertising a local breakfast event, seminar, or fair complete with trade show materials to showcase the best parts of your business. Remember that even though this is an event for your consumers, you’re the one throwing it. 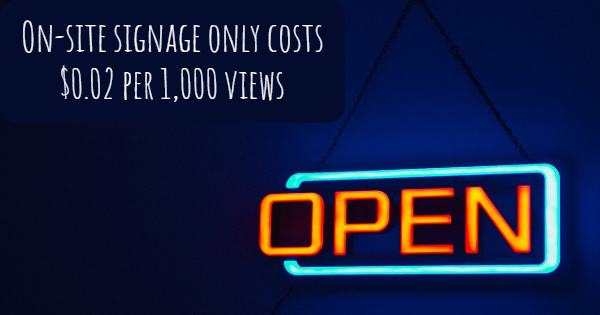 After all, on-site signage only costs two cents per one-thousand views. Nearly everyone is on some form of social media nowadays. It’s almost unheard of for a business to forgo setting up a Facebook account. If you’re not engaging with clients through social media, it’s time to step up your game. This includes advertising for special events, showcasing new developments in your company, and replying to customer concerns. Never doubt the impact in-the-moment social media use can have on a client — or potential customer. So many businesses will send out customer surveys only to find that they never utilized their consumer replies. The feedback from your customers is an essential component to running your store, but it’s even more important that you listen to what your customers say and act on their responses, especially if it’s a customer concern. Try to find commonalities between customer feedback. For example, your customers might hate your logo, ads, or branding. Luckily, digital color printing can help you reimagine the image of your company to better suit the needs and wants of your clients. Offset printing and digital printing services use a nearly unlimited supply of colors and designs for your custom printing and branding. Whether you need banner printing, new business cards, or flyers, digital color printing makes it easier than ever to redesign your business. Rely on the digital color printing service Boston trusts to get the job done right: Boston Business Printing.